Despite Democratic Party leader Lee Hae-chan’s apology for an inappropriate remark about people with disabilities, critics continue to call for his resignation. Incorporated Korea Family Association for the Mentally Disabled held a press conference Monday and urged Lee to step down from his position. 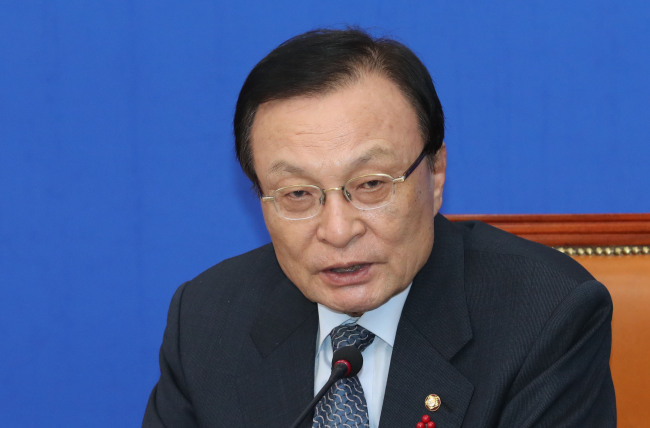 “Lee’s remarks suggested that mentally disabled people are abnormal, and they are more pitiful than physically disabled people,” said Cho Sun-deuk, the chairman of the organization. Lee again apologized for the remark on Monday during the meeting of the Democratic Party Supreme Council at the National Assembly. On Friday, Lee delivered a congratulatory address at the opening ceremony of the Democratic National Committee for the Disabled in Yeouido, Seoul. The remark instantly sparked a public outcry, with many accusing Lee of humiliating people with mental and psychiatric disabilities. Lee issued an official apology Friday night. “I didn’t mean to degrade the disabled, and I agree that the remark can be misunderstood by disabled people and their families. I am deeply sorry,” Lee said. Lee added the comparison had been intended to refer to politicians who spread fake news via YouTube and other social networking platforms.